Professor Satoshi Ōmura is widely recognized as a global expert world in the field of Bioorganic Chemistry, particularly for the discovery, development, biosynthesis and manipulation of useful chemicals derived from naturally-occurring microorganisms. Born in Yamanashi Prefecture, Japan, in 1935, Professor Ōmura received a Masters of Science degree from Tokyo Science University in 1963, followed in 1968 by a Ph.D. in Pharmaceutical Sciences from the University of Tokyo. Two years later, he received another Ph.D. – this time in Chemistry – from the Tokyo University of Science. 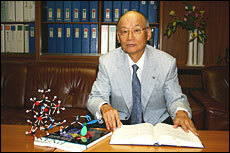 His first position was as a Research Associate at Yamanashi University (1963-1965). 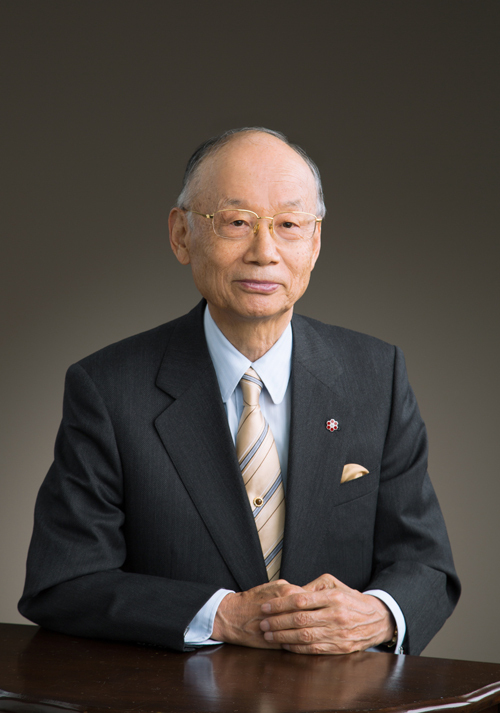 In 1965 he began his career-long association with the Kitasato Institute, initially as a researcher, over the years occupying various posts, culminating in his appointment in 1990 as President. He was President Emeritus of The Kitasato Institute, from 2008 to 2012, and is currently a Distinguished Emeritus Professor and Special Coordinator of the Research Project for Drug Discovery from Natural Products in the Kitasato Institute for Life Sciences, Kitasato University. He was also appointed as inaugural Max Tishler Professor of Chemistry at Wesleyan University (USA) in 2005, a post he still holds in an Emeritus position. Commencing with his studies of Organic Chemistry at the Graduate School of Tokyo University of Science, from 1965 onwards he has performed comprehensive research on Bioorganic Chemistry, focusing on bioactive substances of microbial origin, primarily from soil. Since 1965, the Drug Discovery group at the Kitasato Institute led by Prof Ōmura has continued advanced and pioneering research based on the profound belief that organic compounds produced by microorganisms have immeasurable promise for use in improving the welfare and health of Mankind. By introducing highly-original methods of isolating useful microorganisms, he has discovered 13 novel genera, such as the Kitasatosporia, Longispora and Arbophoma and 42 new species. Exploiting a broad spectrum of often novel microorganisms isolated from soil samples, he has discovered almost 500 organic compounds, many possessing unique chemical structures and/or bioactivities, including many now widely-used antibiotics (for full list, see: Splendid Gifts from Microorganisms, 5th Ed. (2015), Tetrahedron, 67, 6420 (2011)). Among them, 26 compounds and/or their derivatives have been commonly used worldwide as human medicines, agents to improve animal health and husbandry, as agrochemicals, and as reagents for biochemical research. The following are some representative compounds to illustrate the breadth and scope of his discoveries. Cerulenin, produced by a true fungi, Acremonium caerulens, was first isolated by Ōmura and colleagues, who also determined the structure and carried out research on the mode of action of the compound. Cerulenin was the first inhibitor of fatty acid (lipid) biosynthesis ever found. It became the lead compound for development of the hugely important statins, inhibitors of cholesterol biosynthesis. The compound remains a crucial reagent for research (see: J. Antibiot, 20, 349 (1967), Bacteriol. Rev., 40, 681 (1976)). Staurosporine, identified through a search for alkaloids of microbial origin and isolated by Ōmura and colleagues, was found to inhibit protein kinase C (a discovery made over 10 years after Ōmura first discovered the compound). During that time, the relationship between protein kinase C and carcinogenesis was being realised. As a result, the discovery of staurosporine stimulated development of many novel anti-cancer substances, all based on knowledge of the structure and bioactivity of staurosporine. For example, it is well known the development of Imatinib (Gleevec®) and Geftinib (Iressa ®), important and novel anti-cancer agents which are being used more and more widely, have their origins in staurosporine derivatives (see: J. Antibiot., 30, 275 (1979), J. Antibiot., 62, 17 (2009), Chem. Rev., 113, 6761 (2013). Staurosporine is said to be the most widely used biochemical reagent originating from a naturally-occurring microorganism, with the number of scientific papers based on staurosporine research averaging >600 annually over the past 20 years. 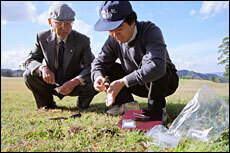 Professor Ōmura (left) oversees collection of soils samples from the fringes of the golf course where the avermectin-producing strain of Streptomyces was found. Ivermectin, a dihydroderivative of avermectin, produced by Streptomyces avermectinius, was discovered and developed by collaborative research with the Merck Company (USA) as a macrolide anthelmintic antibiotic. It was made available on the Animal Health market in 1981. Two years later, it became the biggest selling drug in animal health, a position it maintained for over 20 years. This compound was later found to be a highly safe and effective antinematode agent for treating several human diseases and conditions (see: Antimicrob. Agents Chemother., 15, 361 (1979), Nat. Rev. Microbiol., 2, 984 (2004). The eradication programmes for two devastating tropical diseases, Onchocerciasis and Lymphatic filariasis, which afflict around 1 in 7 of the entire world population, currently being orchestrated by the World Health Organization (WHO), are based primarily on the use of Ivermectin, which has been donated by the Merck Company and the Kitasato Institute since 1987. The drug is being administered to around 300 million people annually. It is envisaged that Onchocerciasis will be eliminated globally by 2025 and Lymphatic filariasis by 2020 (WHO Second Report on Neglected Tropical Diseases “Sustaining the drive to overcome the global impact of neglected tropical diseases”, 2013). With respect to Onchocerciasis, disease elimination has virtually been completed in Latin America and is well on the way to success in Africa. S. avermectinius, discovered by Ōmura and co-workers, is the only avermectin-producing organism ever found and that single organism has been the sole source of industrial production ever since. It is widely held that the discovery and use of ivermectin represents the greatest public health intervention of the last quarter of the 20th century and can be regarded as on a par with the discovery and use of penicillin, with the 2015 Nobel Prize for Physiology or Medicine being awarded to Prof Ōmura for his role in ivermectin’s discovery. Prof Ōmura has also built up an excellent body of research findings on the relationships between chemical structure, bioactivity and mode of action of many other macrolide antibiotics, such as leucomycin, tylosin, spiramycin and erythromycin. Among them, rokitamycin, a derivative of leucomycin coupled with tilmicosin, a derivative of tylosin, have been used with great effect as human medicines. Among other compounds discovered by Prof Ōmura and his group, lactacystin (J. Antibiot., 44, 113 (1991)) and herbimycin (Tetrahedron Lett., 20, 43213 (1979)) proved to be inhibitors of proteasome and Hsp-90, respectively, and their many related compounds have been or are being developed as anti-cancer/anti-tumor agents, including Bertezomib (Velcade®) (Tetrahedron, 67, 6420 (2011)), (Neoplasia, 7, 1104 (2005), while also being used widely as reagents in biochemical research. Neonicotinoid agrochemicals were once commonly used but their use was later restricted due to their adverse environmental impact. Fortunately, a derivative of pyripyropene (J. Antibiot., 46, 1168 (1993)), discovered by Prof Ōmura, proved to possess potent insecticidal activity and is now under development as an agrochemical through a collaboration between Japan’s Meiji Seika Pharma and BASF (Germany). "Inscalis" represents a new chemical class, the pyropenes, which display a novel mode of action for controlling key insect pests such as aphids, whiteflies, psyllids, scale insects and leafhoppers. The natural organic compounds which have appeared as a result of Prof Ōmura’s initiatives and endeavours have been used worldwide as medicines, agrochemicals and reagents for biochemical research, and have greatly contributed to progress in the welfare and health of Mankind, as well as being essential elements in making possible major steps forward in biomedical knowledge and understanding. Alongside his discovery work, Prof Ōmura has studied in depth the mechanisms used by microorganisms to produce various kinds of substances, in particular carrying out extensive research at the genetic level. His elucidation and application of the genetic control of chemical compound formation has made it possible to manipulate living microorganisms to produce novel compounds, as well as creating the potential and ability to produce completely synthetic compounds. As an example of this, Prof Ōmura obtained various mutants of S. avermectinius in which part of the biosynthetic pathway of avermectin was blocked. He determined the production pathway of the compound by isolating various precursors accumulated in each mutant (J. Bacteriol., 169, 5615 (1987). Each mutated point on the chromosome was identified, eventually allowing him to clone all 17 genes concerned with avermectin biosynthesis. Furthermore, the work clarified the function of each gene, providing a complete understanding of the biosynthetic mechanism for producing avermectin (Chem. Rev., 97, 2591 (1997). The ground-breaking genetic analysis of S. avermectinius was the world’s first for a commercially-important actinomycete, and it also found that the actinomycete has genes which produce 37 kinds of organic compounds (secondary metabolites) besides the immeasurably important avermectin (Proc. Nat. Acad, Sci., USA, 98, 12214 (2001), Nature Biotechnol., 21, 526 (2003). 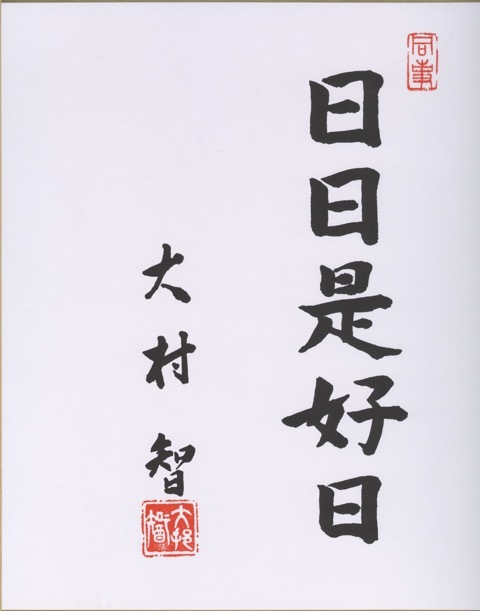 Following Ōmura’s lead, creation of novel compounds using genetic engineering is now carried out widely. Ōmura’s original collaboration and continued pioneering work in this area resulted in the appearance of Mederrhodin (Nature, 314, 642 (1985)), created by Prof Ōmura together with Dr David A. Hopwood in England. This remarkable compound was the first novel biosynthetic antibiotic created using genetic engineering and is worthy of recognition as being the pioneer compound in a completely new research field offering unmatched promise. Several other compounds discovered by Prof Ōmura, such as atpenin A5, a potent inhibitor of mitochondria Complex II, arisugasin A, an inhibitor of acetylcholine esterase and triacsin C, an inhibitor of long chain acyl CoA synthetase, are all used widely as research reagents and have been important tools in pioneering and Nobel Prize-winning research, such as on cell communication. Prof Ōmura’s broad range of research work includes a strong focus on the isolation of novel microorganisms and discovery of useful active substances, including the discovery of excellent antibiotics, and understanding of their modes of action and targets. Moreover, with a view to the future, his path-finding research on the genetic mechanisms through which organic compounds are generated by microorganisms has created the ability to induce microorganisms to produce an ever-increasing array of novel compounds. 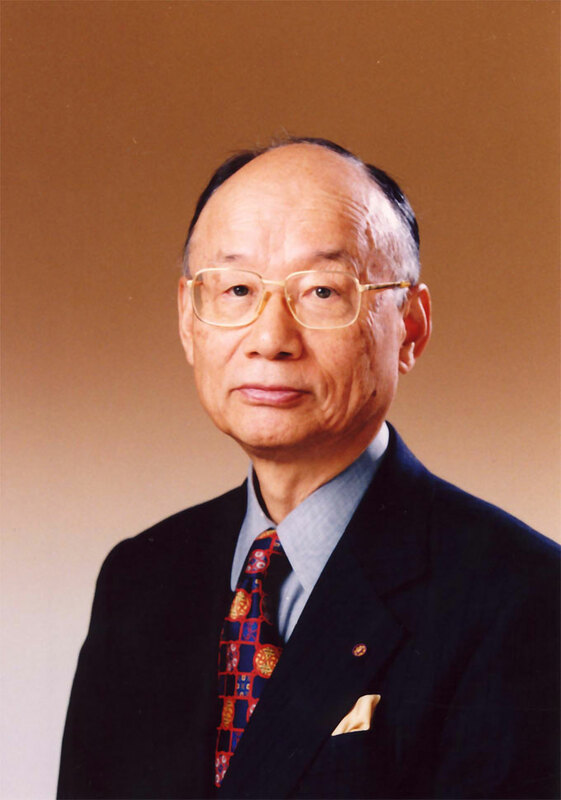 Prof Ōmura’s work has, not surprisingly, led to him being widely recognized as a world leader and pioneer in his specific fields of activity, and he has received many highly-prestigious awards from institutions, scientific bodies, academic associations, governments and others, both nationally and internationally. 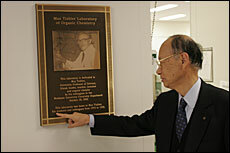 Professor Ōmura stands before a plaque commemorating his colleague and mentor, Prof Max Tishler, ex-Head of Merck Sharpe and Dohme and Professor of Chemistry at Wesleyan University. Among other international academic institutional memberships, the Professor has been elected as a member of the Japan Academy, Leopoldina Deutsche Akademie der Naturforscher, and European Academy of Sciences. He is also a foreign associate of the U.S. National Academy of Sciences, the Institut de France Academie des Sciences, and the Chinese Academy of Engineering. 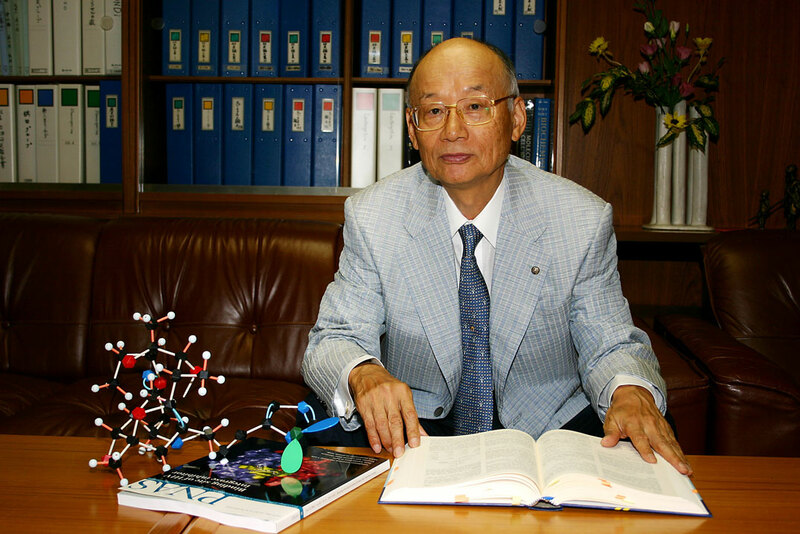 His honorary memberships include those of the American Society of Biochemistry and Molecular Biology, the Royal Society of Chemistry (UK), and the Chemical Society of Japan. In 2007, Prof Ōmura was awarded the l’Ordre National de la Legion d’honneur (Chevalier), the highest formal recognition of merit bestowed by the government of France. In 2012, he was designated as a highly-prestigious Person of Cultural Merit in Japan, followed by the Order of Cultural Merit in 2015. 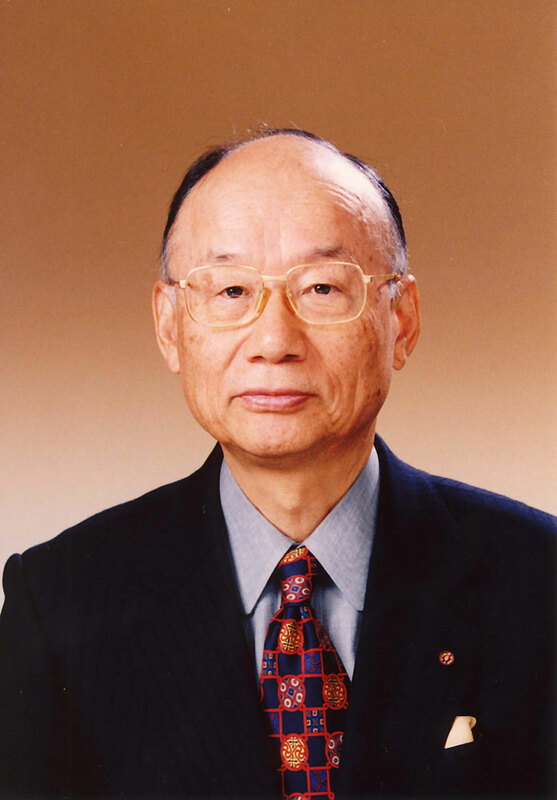 Since 1973, Professor Ōmura was a long-standing member of the Editorial Board of the Journal of Antibiotics, becoming Editor-in-Chief during 2004-2013. He continues to publish extensively and among his books, the Macrolide Antibiotics (2nd edition) remains a world-leading textbook, while he has also published several volumes of personal essays and annually produces his own personalized calligraphy. 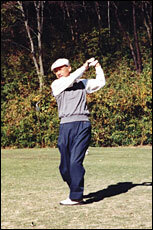 The Professor is a consummate golfer and cross-country skier, and remains a leading patron of Japanese art, remaining very active in this sphere of activity, establishing his own art museum, which is open to the public in his home town in Japan (see: http://www.nirasakiomura-artmuseum.com/index.html - Japanese only).